From being preached by John the Baptist, a humble prophet, the kingdom of God grew as many were baptized in preparation to receive the Messiah. From the mouth of God incarnate, humbly born in Bethlehem, the kingdom of God continued to grow as people believed Jesus Christ was Lord. And from the small number of Jesus’ first disciples, the kingdom of God continued to expand as those who heard the gospel came to faith. The kingdom of God expands from very humble beginnings. It is like the minuscule mustard seed which, when planted, becomes a great tree. It is like yeast that has the power to cause a large amount of flour to expand. From Christianity’s beginning, the kingdom of God has expanded. Who would have thought that from Christ’s first disciples, the gospel would reach the world? Who would have thought that from the mouths of western missionaries who traveled to other nations of the world without knowledge of the local languages and cultures, whole tribes and nations would hear the gospel and believe? While its beginnings may appear negligible, the kingdom of God continues to expand through Christians who witness in their families, communities, and world that Jesus Christ is Lord and Savior. 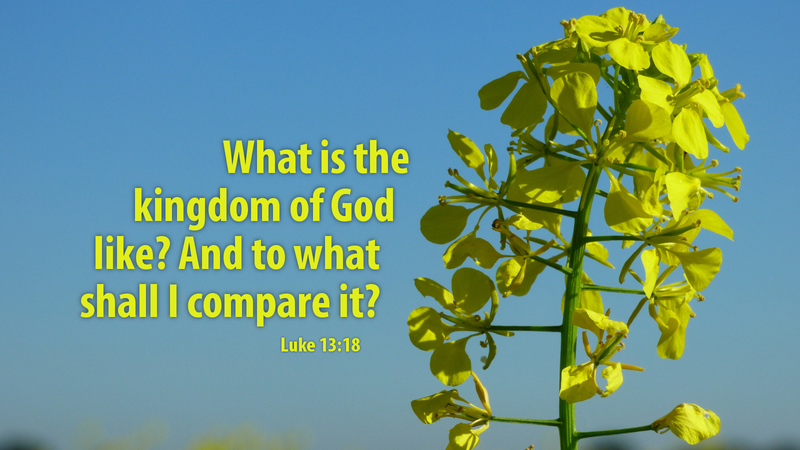 Prayer: Lord Jesus Christ, use me today as a catalyst for your kingdom’s expansion among my friends, family, and all people with whom I come in contact. Amen.